So I'm making a map of my fantasy world (it's got six main continents and it's an earth like planet) and I'm not entirely sure how to make it realistic, and I'm not entirely sure where to start. I care a lot about detail and I don't want to mess it up. Where do I put my mountains/ rivers/ forests/ volcanoes/ glaciers? Where should I put islands? Where do different types of biome normally go? 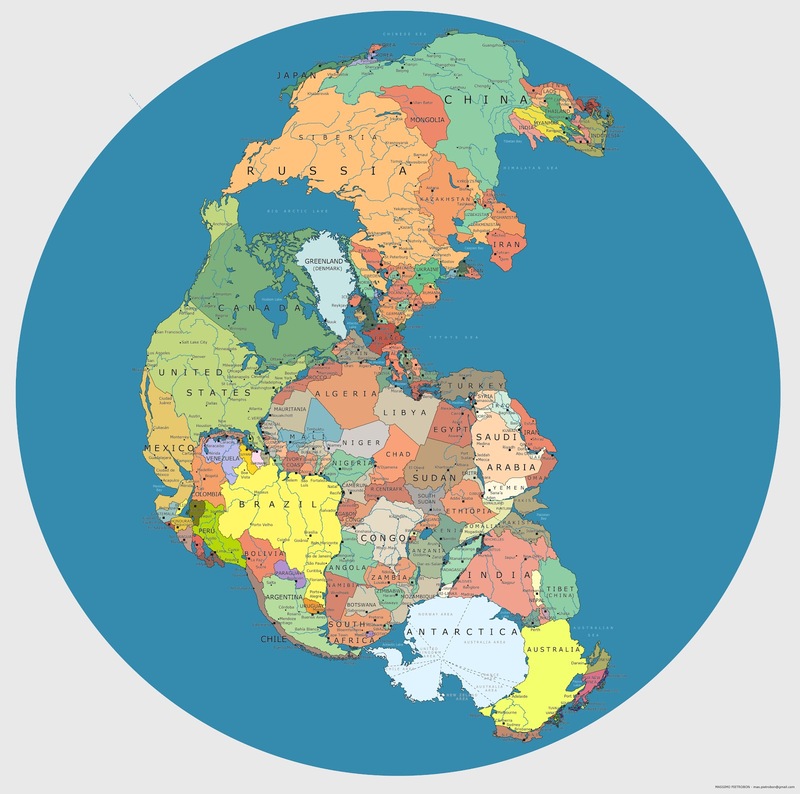 Also, I was wondering if my continents should all join up like puzzle pieces or something like the continents on Earth do. Do arctic/ antarctic regions at the poles matter? Does the shape of continent matter? How do I know where to put the borders between countries? Where would roads normally go? Which places would be most inhabited? Also, depending on where each continent is does it make it more susceptible to certain natural disasters? I know it's a lot of questions but I an grateful for any help that I recieve. Thank you! The first thing I suggest you do is define your tectonic plates. In case you didn't know, the Earth's crust is divided into seven major chunks which account for 94% of its surface area - the remaining 6% is occupied by smaller plates. Each of these plates is moving, very slowly, in a specific direction. Where plates are pulling apart, there will be volcanoes. Where they are pushing into eachother, there will be mountain ranges. I could go on for quite a long time about how plate tectonics affects the geography of a planet, but that should be enough to give you a basic map. Once you have your mountains sorted out, you can get a rough idea of the overall topography of your planet by filling in the areas in between with a gradient between mountains and plains. From there, you can work out where to put rivers - all rivers start at an area of high elevation, and move on the easiest path downwards until they reach the sea (Or in some cases, simply fizzle out inland, like the Okavango river). Now, decide what kind of climate you want to give your planet. The hotter the global climate, the smaller the areas of ice at the poles (During exceptionally warm periods like the Eocene, there were no polar ice caps). Also, the hotter the climate, the wetter the weather, provided that there isn't too much uninterrupted land (E.g. supercontinents). In the wetter parts of the land, there will be forests, while in the drier areas, there will be grassland. To properly determine which parts get rain and which parts don't, you'd have to map out the prevailing winds like this, but you can leave that part out for a casual worldbuilding project. In short, however, rainstorms are generated in the oceans, so if the prevailing winds are in a direction such that they blow these storms towards a certain area of land, then that place will likely be wetter rather than drier. So, when you know which areas receive more rain, you can figure out your biomes. Basically, in the tropics, wetter areas will be jungle, drier areas will be savannah, and the driest areas will be deserts. Between the tropics and the polar regions (the temperate zones), the wetter areas will be forest, the drier ones temperate grassland, and the driest places desert again. Then, moving either north or south, there'll be a band of boreal forest, then one of tundra, and finally one of ice. Whether these last few biomes will exist depends on the climate you've set for your world. Islands are found wherever underwater mountains stick up above sea level, so they could be found along sea mountain ranges (on convergent plate boundaries), on volcanoes (on divergent plate boundaries or volcanic hotspots, which can occur anywhere) or where continents have been pulled apart by tectonic plates. Roads are usually found connecting settlements (which are themselves often located on rivers or by the sea) and will usually take the easiest, flattest route there. Use your topography map to decide which way has the least hilly terrain. The most inhabited place will be where there is water and fertile land. Fertility of land depends on a lot of things - perhaps the region is volcanically active and the ash makes the soil fertile, or perhaps a local river frequently floods the area with new soil. Natural disasters have many different causes, and each cause will be more common in a certain area. Earthquakes will be found along any plate boundary, while volcanic eruptions will occur where there are volcanoes, obviously. There will be avalanches in the highest/coldest mountains, floods next to rivers and hurricanes along coastal regions bordering large, warm oceans. That answers all of your questions except the one on borders, which is simply too complex to answer in a single post. As a tip, though, try use natural barriers as borders - e.g. mountains, rivers etc., as those often end up as landmarks between territories in the precursors to nations. This may not apply if the country has split off from another one. Where do I put my mountains/ rivers/ forests/ volcanoes/ glaciers? Where should I put islands? Mountains & Islands (since they are essentially the same thing in many cases) often occur in chains, lines or ranges. This is due to the way that the earths continents are (essentially) large floating sheets. As for where to put them it might be worth noting the differences between different tectonic boundries. I'd advise this video by Artifexian https://www.youtube.com/watch?v=x_Tn66PvTn4 It's worth noting that theese lines are often quite "messy" meaning if you have any story conditions you can probably bend your plate tectonics to fit. Rivers go from High (mountains plateus or just the ground if nothing else higher exists) to low, though not often sensibly their routes are often very long. They always join and rarely split. Glaciers are similar, but where it's very very cold, year round. Types of biome is harder, if you are doing an earth-like world it's quite simply you have a tropical biome on the Mediterranean with outwardsly placed rings of Desert, Temperate and Artic biomes in that order. That being said due to the complexity of ecology a wide verity of possible biome arrangements are possible for future reference i'd advise simply asking on this stack exchange a "reality-check" question for any biome arrangements you might want to explore. It's worth noting there are some "unbreakable" rules. Coastal regions are more temperate, for instance. Also, I was wondering if my continents should all join up like puzzle pieces or something like the continents on Earth do? Do polar regions matter? Well not much to the people in your world (probably) it's quite likely they'd leave said regions of their maps. But yes they do matter, their shape is dictated by complex underwater currents as well as by the landmasses beneath them and they have an undeniable effect on the climate, such as through their albedo. Yes, i'm not sure how else to answer this it matters hugely. For a wide variety of reasons far to complex to go into. Large continents will possibly be more technologically advanced, ones with more coast will likely be richer etc.. etc..
You don't humans are really unpredictable and there are some strange borders out there. That being said they will often follow natural borders such as rivers, marshes, deserts, oceans, mountain ranges and areas of low agricultural yield. Between places, again not sure how else to answer. They will obviously only be built were feasible. (no free-ways over mount Everest.) but in general try to think "Do people have a reason to go from A to B" if answer = yes and better methods (rail, ocean) are not available then there is a road. Same as our world. Areas with a lot to offer in the form of food & water and other industries. Bonus points for stable empires. Yes definitely. Being near tectonic boundaries will cause more Earthquakes & Tsunamis while being near hot waters will cause more tropical storms. Not the answer you're looking for? Browse other questions tagged reality-check geography science travel map-making or ask your own question. How to exploit a groundhog's day loop to do the most good? How to make a planet map? How realistic is the placement of the cities and borders on my map? How realistic is the geography of my map? What technology would be most useful/viable for preservation in the event of an apocalypse? How can I get my continent placement and latitude lines right to make my climates work?